Today in Masonic History John Gutzon de la Mothe Borglum passes away in 1941. John Gutzon de la Mothe Borglum was an American sculptor. Borglum was born on March 25th, 1867 in St. Charles in the then Idaho Territory. His father was a Mormon and in a polygamous marriage. It was Borglum's father second wife who was his mother. When Borglum's father decided to leave Mormonism, he moved the family to Omaha, Nebraska where polygamy was illegal and taboo. He left Borglum's biological mother behind and Borglum was raised by his father and his father's first wife. Borglum attended Saint Mary's College in Nebraska briefly before graduating from Creighton Preparatory School. He then moved on to Académie Julian in Paris where he was nicknamed Auguste Rodin due to the strong influence of Rodin on his work. 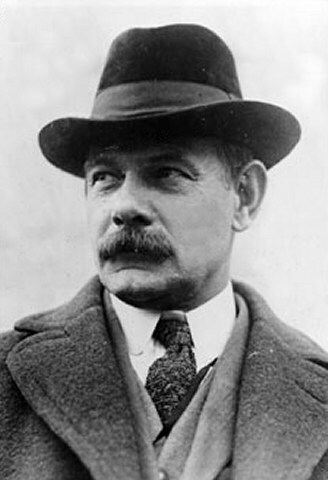 Some time prior to 1901 Borglum returned to the United States and began living in New York City. There he sculpted saints for the new Cathedral of Saint John the Divine. In 1906 he had a group sculpture accepted by the Metropolitan Museum of Art. It was the first time that a work of art was accepted by a living artist. In 1915, Borglum was approached by the United Daughters of the Confederacy to begin work on what would become the Stone Mountain Monument. For the next decade Borglum would work on the project which was largely funded by the Ku Klux Klan (KKK). It is believed that Borglum, who was at a minimum sympathetic to the ideals of the KKK, joined the organization. This is something that Borglum himself denied. It is claimed by two biographers of Borglum that the denial was for "public consumption." Regardless of whether Borglum was a member of the KKK, in-fighting in the organization led to Borglum being dragged into the middle of fight. In 1925, Borglum destroyed his clay and plaster models and abandoned the project. Borglum was replaced on the project by another artist who destroyed, with dynamite, any work that Borglum had accomplished at Stone Mountain. The work that Borglum did on the Stone Mountain Monument gave him skills and tools that would later help him with the Mount Rushmore project. This included what Borglum called his "Magic Lantern" which allowed him to project images on the rock face for carving. In 1925, Borglum was in Texas and worked on the monument for trail drivers. Although he completed the model in1925, it was not cast until 1940 and then it was a quarter the size due to budget cuts on the project. In 1927, Borglum began work on the Mount Rushmore project. He would work on it until the end of this life. His first attempt to put Thomas Jefferson on Rushmore was a failure and it was blown up to make way for the new sculpting. Eventually Washington and Jefferson were in place and Lincoln and Teddy Roosevelt, who was a fan of Borglum's work, were put in place. Borglum passed away on March 6th, 1941. He passed away due to complications from surgery. Borglum was a member of Howard Lodge No. 35 in New York City, New York. He was raised on June 10th, 1904 and served as Worshipful Master of the Lodge. He received his Scottish Rite degrees in 1907.